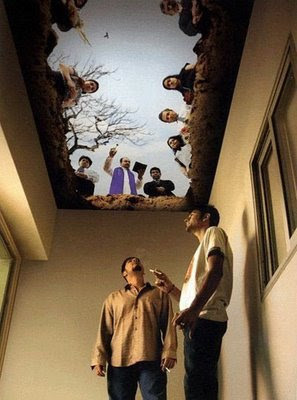 Nancy's Nook : How would you like . . .
. . . to have this on your ceiling?
. . . or this on your floor? I just saw those and thought: BLOG! I'm with laura on that one. 1. 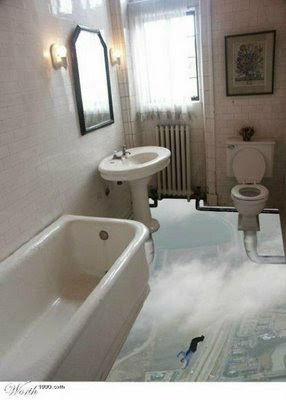 I think I'd go with the missing ceiling, because at least you can't fall through the floor and die (you're already 6 feet under) . . . hmmm, this is strange and going nowhere fast . . .
Well, anyway, the first one seems to be slightly better to me. 2. I liked your old name, but I also think "Blog, She Wrote" is very clever! My mom and I used to watch "Murder, She Wrote" together, so it brings back good memories. 3. I am looking forward to reading your Bear Valley book!! !